Imagine a very small landscape built out of miniature plants, where pebbles become pathways and a piece of wood becomes a bench. Tiny tables and chairs welcome magic at any moment. Can you picture it? If you can, you’ve imagined the beginning of your own fairy garden. Fairy Gardens are captivating gardeners of all ages. They’re a great way to introduce kids to gardening and remind adults about the joy of whimsical imagination. Fairy Gardens have been around since the Victorian era, but have recently become a very popular way to escape and find joy in the garden. It doesn’t take much to get started, but once you begin to fill your fairy garden the possibilities are endless! Lomond View Fairy Garden Event April 22, 2017 from 10am-12 noon. If you’re new to the fun, come at 10:30 for a live demonstration. We’ll have everything you need to create and take home your very own fairy garden. If you have been creating these charming gardens for a while, drop by and check out the adorable accessories that fill our shelves. While you’re here, enjoy complimentary fairy treats and exchange ideas with other fairy gardeners. Go to http://lomondviewnursery.com/class-events/ to register for this free event! Bring your Grandkids, bring your Grandparents, bring everyone in-between. Fairy gardening really is for everyone! At Lomond View we believe the beauty of the garden is inspiring. 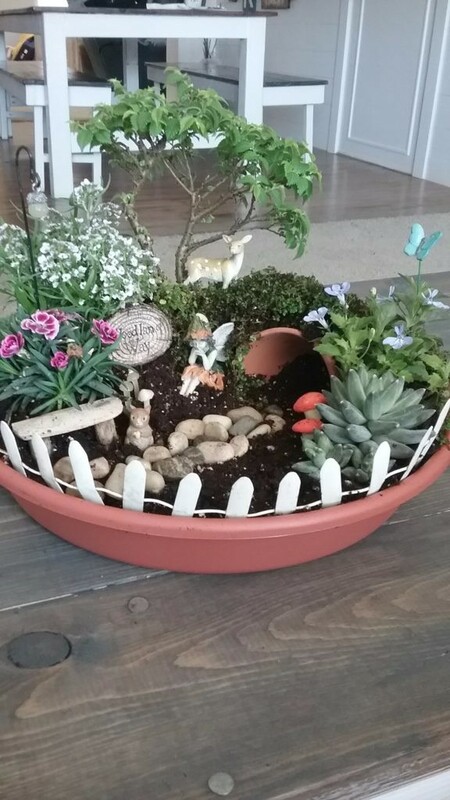 Fairy gardens are one of the many ways to find that inspiration and joy. The demonstration/workshop will be at 10:30 am. Amber Winward, a fairy garden expert, is coming to lead the demonstration and help you build the perfect fairy garden. The picture shown here is very similar to the basic starter garden mentioned below. We will have many other options available in containers, plants and decor. Of course, the most important things to add will be your choice of fairies and fairy accessories. Price will vary depending on what you put in your fairy garden. Base cost will be $25 for: our basic planter bowl, soil, sphagnum moss, 1 annual or perennial and 1 jumbo pack of flowers (6 flowers). The picture above gives you an idea of what the basic bowl will look like, plants will vary. 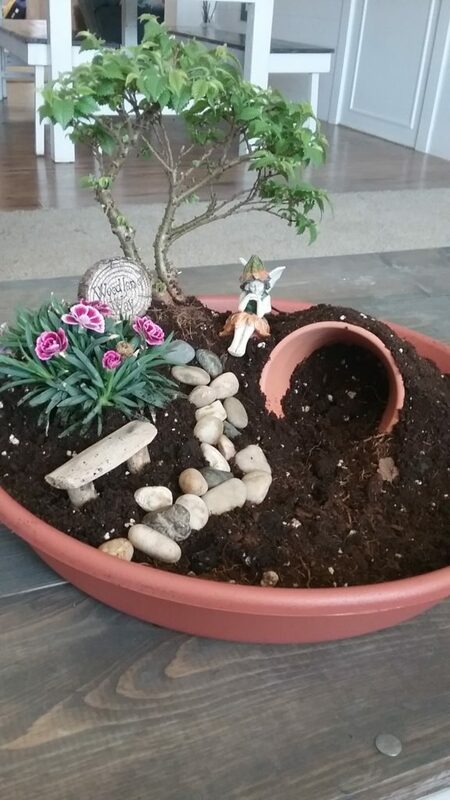 For a non-living fairy garden, base price will be $15 and will include planter bowl, bark and faux moss. 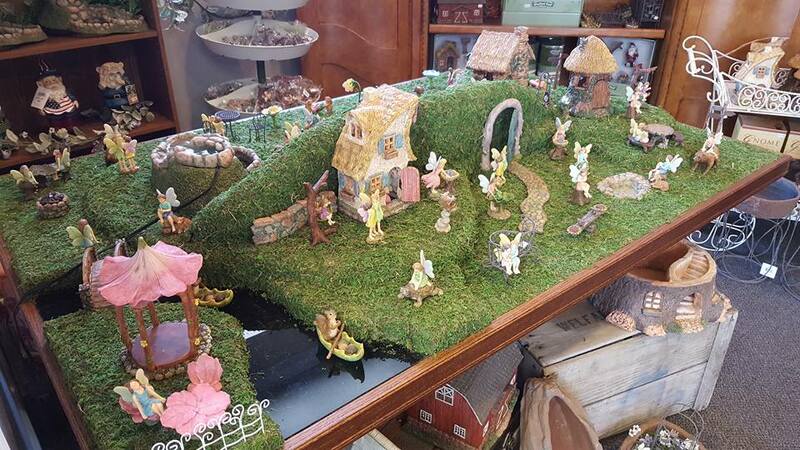 You will add your own selection of fairy figurines and accessories from the many adorable options we have available. We have a great assortment of fun container options that you can upgrade to and premium fairy garden plant options. You will receive a 10% discount on any fairy garden related purchase beyond the basic package.